The Porsche Panamera is quite an overachiever. Honestly, it is. Where else can you find a high-performance sedan (it’s one of those coupe-sedan-wagon things we talked about a few days ago) that can be a fire-breathing monster? Indeed, the add-ons and changes used by the German tuner Techart to do the job. 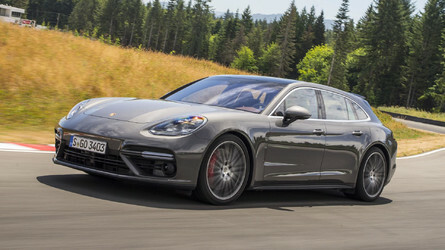 The tuner will introduce an upgraded version of their GrandGT kit for the Panamera Sport Turismo. It will debut at the upcoming Geneva Motor show. Called the GrandGT Supreme, the kit combines the Panamera’s aggressive body styling with added bits of cabin opulence. The updated kit’s front end is similar to the GrandGT. However, there’s a new hood that has a large power bulge. The bulge represents the added power available. Also, there are fuller fenders and lower side sills that give the Panamera a broader more muscular stance. The rear diffuser seems bigger than the existing kit. The whole kit-based vehicle rides on 22-inch Formual IV wheels provided by Techart. The wheels are unique in that they have five sets of deouble strakes. Techart’s kit also features cabin upgrades that include Nappa leather that used for upholstery as well as side panels and foot well. Multi-colored stitching offsets the interior look on the front seat bolsters, door panels. Together the leather and stitching give the interior a very opulent look.